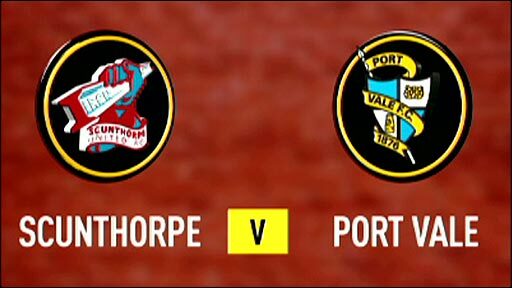 Paul Hayes and Grant McCann scored in extra time to earn Scunthorpe a deserved win over Port Vale in the third round of the Carling Cup. Vale had keeper Chris Martin to thank for keeping the score at 0-0 after 90 minutes with a string of fine saves. But the hosts took the lead two minutes into extra time when Hayes deflected Michael O'Connor's shot past Martin. And McCann secured the win three minutes later, exchanging passes with Matthew Sparrow, to fire past Martin. 120:00+1:38 The match is over. 120:00+0:01 Shot from 18 yards from Marc Richards. Save by Sam Slocombe. Corner taken by Tommy Fraser from the right by-line, Unfair challenge on Sam Slocombe by John McCombe results in a free kick. Sam Slocombe restarts play with the free kick. 119:29 Outswinging corner taken right-footed by Tommy Fraser from the right by-line. 117:36 Substitution (Scunthorpe) makes a substitution, with Sam Togwell coming on for Michael O'Connor. 117:12 Robert Taylor takes a shot. Blocked by Sam Slocombe. 115:53 Michael O'Connor concedes a free kick for a foul on Simon Richman. Tommy Fraser takes the free kick. 115:04 Marc Richards takes a shot. Blocked by David Mirfin. John McCombe has a drilled shot. Save made by Sam Slocombe. 114:28 Drilled right-footed shot by Martyn Woolford. Chris Martin makes a save. 112:42 Booking The referee shows Gareth Owen a yellow card for unsporting behaviour. 112:24 Unfair challenge on Michael O'Connor by Lee Collins results in a free kick. Free kick taken by Jordan Spence. 111:43 Drilled right-footed shot by Michael O'Connor. Blocked by Lee Collins. 110:49 Corner taken short by Martyn Woolford. 108:49 Kris Taylor takes a inswinging corner. John McCombe takes a shot. Niall Canavan gets a block in. 108:07 Jonathan Forte takes a shot from 18 yards. Save made by Chris Martin. 107:13 Substitution Martyn Woolford on for Paul Hayes. 104:28 A cross is delivered by Tommy Fraser, Jordan Spence manages to make a clearance. Inswinging corner taken by Kris Taylor from the right by-line. 103:47 Corner taken by Tommy Fraser from the right by-line. 103:07 Marcus Williams delivers the ball. 102:08 Jonathan Forte produces a drilled left-footed shot from deep inside the penalty box which goes wide of the left-hand upright. Niall Canavan fouled by Marc Richards, the ref awards a free kick. Direct free kick taken by Josh Wright. 100:49 Shot by Robert Taylor. David Mirfin gets a block in. Corner from the left by-line taken by Tommy Fraser, save made by Sam Slocombe. 99:14 Shot by Jonathan Forte. Save by Chris Martin. 97:24 Simon Richman takes a shot from close range clearing the crossbar. 96:55 Jonathan Forte takes a shot. Save by Chris Martin. 94:54 Assist on the goal came from Paul Hayes. 94:54 GOAL - Grant McCann:Scunthorpe 2 - 0 Port Vale Grant McCann gets on the score sheet with a goal from inside the box to the bottom left corner of the goal. Scunthorpe 2-0 Port Vale. 91:45 The assist for the goal came from Michael O'Connor. 91:45 GOAL - Paul Hayes:Scunthorpe 1 - 0 Port Vale A goal is scored by Paul Hayes from inside the box low into the middle of the goal. Scunthorpe 1-0 Port Vale. 90:51 Michael O'Connor takes a shot. 90:29 The ball is sent over by Marcus Williams, clearance made by Gareth Owen. 90:00+3:39 The whistle goes to signal the end of normal time, with extra time looming. 90:00+2:17 The ball is swung over by Matthew Sparrow, clearance made by Sam Stockley. Michael O'Connor takes the inswinging corner, Shot from inside the six-yard box by Jordan Spence goes wide right of the target. 90:00+1:10 Jordan Spence takes a shot from just outside the penalty area clears the crossbar. 90:00+0:48 Substitution Sam Stockley goes off and Adam Yates comes on. 89:50 Jonathan Forte has an effort from just inside the box that misses to the left of the target. 88:06 The referee blows for offside. Sam Slocombe takes the free kick. 87:36 Jonathan Forte crosses the ball, comfortable save by Chris Martin. 87:05 A cross is delivered by Michael O'Connor, Sam Stockley manages to make a clearance. 86:53 A cross is delivered by Matthew Sparrow, save by Chris Martin. 86:36 Kris Taylor takes a shot. Save made by Chris Martin. 86:01 Josh Wright is penalised for handball and concedes a free kick. Free kick taken by Tommy Fraser. 85:26 Jordan Spence produces a cross. 82:47 Corner taken by Tommy Fraser from the left by-line played to the near post, Grant McCann manages to make a clearance. 82:26 A cross is delivered by Michael O'Connor, Paul Hayes takes a shot. Save made by Chris Martin. 79:09 Substitution Robert Taylor joins the action as a substitute, replacing Lewis Haldane. 79:09 Inswinging corner taken left-footed by Grant McCann played to the near post, save by Chris Martin. Inswinging corner taken by Grant McCann from the right by-line, Header from deep inside the penalty area by Paul Hayes goes harmlessly over the crossbar. 77:59 Substitution Doug Loft goes off and Simon Richman comes on. 76:52 Marcus Williams delivers the ball, clearance made by Kris Taylor. Correction - 73:20 Corner taken by Kris Taylor from the right by-line to the near post, Grant McCann manages to make a clearance. Kris Taylor crosses the ball, Sam Slocombe makes a save. 73:20 Corner taken by Kris Taylor from the right by-line to the near post, clearance by Niall Canavan. Kris Taylor sends in a cross, save by Sam Slocombe. Correction - 71:12 Unfair challenge on Paul Hayes by Gareth Owen results in a free kick. Strike comes in from Grant McCann from the free kick. 71:12 Free kick awarded for a foul by Gareth Owen on Paul Hayes. Grant McCann has an effort direct from the free kick. 70:42 Effort from 25 yards by Josh Wright. Gareth Owen gets a block in. 70:07 Marc Richards produces a cross, save by Sam Slocombe. 68:31 Jonathan Forte is flagged offside by the assistant referee. Free kick taken by Chris Martin. 67:55 Lewis Haldane challenges Jordan Spence unfairly and gives away a free kick. Sam Slocombe takes the direct free kick. 67:12 Jonathan Forte has an effort at goal from 25 yards. Lee Collins gets a block in. Corner taken by Matthew Sparrow from the left by-line to the near post, Kris Taylor makes a clearance. Michael O'Connor delivers the ball, comfortable save by Chris Martin. 65:54 Shot by Grant McCann from outside the box goes over the net. 64:28 Booking Booking for Lewis Haldane. 63:09 Paul Hayes takes a shot. Blocked by Gareth Owen. Corner taken right-footed by Josh Wright, clearance by Anthony Griffith. 61:29 Matthew Sparrow takes a shot. Save made by Chris Martin. Corner taken left-footed by Grant McCann from the right by-line, Paul Hayes has a headed effort at goal from deep inside the area missing to the right of the target. 59:12 Kris Taylor produces a cross, Lewis Haldane takes a shot. Save made by Sam Slocombe. 58:08 Shot from a long way out by Matthew Sparrow goes wide of the left-hand post. 57:23 A cross is delivered by Marcus Williams, Grant McCann has a headed effort at goal from deep inside the area missing to the right of the goal. 55:46 Foul by Doug Loft on Grant McCann, free kick awarded. Strike on goal comes in from Michael O'Connor from the free kick. 52:30 Foul by Matthew Sparrow on Anthony Griffith, free kick awarded. Chris Martin takes the direct free kick. 52:10 David Mirfin crosses the ball. 51:38 Free kick taken by Grant McCann. 51:38 Booking Anthony Griffith booked for unsporting behaviour. 51:33 Foul by Anthony Griffith on Josh Wright, free kick awarded. 50:03 Jonathan Forte has a headed effort at goal from deep inside the area missing to the left of the target. 49:40 Shot by Josh Wright. Save by Chris Martin. 48:32 Drilled left-footed shot by Michael O'Connor. Chris Martin makes a comfortable save. 48:09 Doug Loft concedes a free kick for a foul on Jordan Spence. Sam Slocombe takes the direct free kick. 47:46 Centre by Sam Stockley, Jordan Spence manages to make a clearance. 46:46 Unfair challenge on Anthony Griffith by Jonathan Forte results in a free kick. Direct free kick taken by Chris Martin. 45:20 Free kick awarded for an unfair challenge on Marc Richards by David Mirfin. Free kick crossed right-footed by Tommy Fraser from left wing, clearance made by Niall Canavan. Tommy Fraser takes a inswinging corner to the near post, clearance by Sam Slocombe. 45:00+3:20 The match has reached half-time. 45:00+2:57 Shot from 25 yards from Michael O'Connor. Blocked by Kris Taylor. 45:00+2:25 Unfair challenge on Michael O'Connor by Kris Taylor results in a free kick. Grant McCann delivers the ball from the free kick left-footed from right wing. 45:00+1:35 Gareth Owen concedes a free kick for a foul on Paul Hayes. Free kick crossed right-footed by Michael O'Connor, Lee Collins manages to make a clearance. 45:00+1:04 Effort on goal by Lewis Haldane from outside the box goes harmlessly over the bar. 44:22 Lewis Haldane produces a cross, Shot from just outside the box by Doug Loft goes over the crossbar. 43:30 Lewis Haldane is caught offside. Sam Slocombe takes the free kick. 42:33 Foul by Marcus Williams on Lewis Haldane, free kick awarded. Centre by Tommy Fraser, Marc Richards takes a shot. Save made by Sam Slocombe. 40:22 Shot on goal comes in from Grant McCann from the free kick, save made by Chris Martin. 40:22 Booking Sam Stockley goes into the book. 39:33 Doug Loft concedes a free kick for a foul on Michael O'Connor. Jordan Spence takes the free kick. Foul by Sam Stockley on Marcus Williams, free kick awarded. 38:24 Shot from outside the penalty box by Doug Loft goes wide right of the goal. 37:01 Foul by Lee Collins on Paul Hayes, free kick awarded. Paul Hayes takes the free kick, Effort from outside the area by Niall Canavan goes wide right of the goal. 36:13 Centre by Grant McCann, clearance by Kris Taylor. 35:25 Niall Canavan fouled by Lewis Haldane, the ref awards a free kick. Sam Slocombe takes the free kick. 34:39 Free kick awarded for an unfair challenge on Sam Slocombe by Lewis Haldane. Direct free kick taken by Sam Slocombe. 33:44 Marcus Williams has an effort at goal from outside the penalty box missing to the wide right of the goal. 31:52 Inswinging corner taken left-footed by Grant McCann, Jonathan Forte takes a shot. Chris Martin makes a save. 31:23 Free kick awarded for an unfair challenge on Michael O'Connor by Doug Loft. Direct free kick taken by Michael O'Connor. 27:25 The ball is swung over by Sam Stockley, David Mirfin makes a clearance. 24:50 Substitution Sam Slocombe on for Joe Murphy. 19:52 Corner from the left by-line taken by Michael O'Connor, Grant McCann produces a left-footed shot from the edge of the area and misses to the left of the target. 19:11 Michael O'Connor produces a drilled left-footed shot from outside the penalty box and strikes the post. Inswinging corner taken by Grant McCann from the right by-line played to the near post, clearance made by Tommy Fraser. 18:32 Niall Canavan fouled by Lewis Haldane, the ref awards a free kick. Free kick taken by Joe Murphy. 17:02 John McCombe challenges Jonathan Forte unfairly and gives away a free kick. Grant McCann delivers the ball, drilled left-footed shot by David Mirfin. Gareth Owen gets a block in. 15:32 Free kick awarded for an unfair challenge on Paul Hayes by Sam Stockley. Paul Hayes takes the free kick. 14:43 Lewis Haldane takes a shot. Blocked by David Mirfin. Corner taken left-footed by Kris Taylor from the left by-line, Paul Hayes makes a clearance. Shot by Tommy Fraser. Joe Murphy makes a comfortable save. 13:43 Gareth Owen produces a left-footed shot from inside the area that goes over the bar. 10:56 Unfair challenge on Lewis Haldane by Jordan Spence results in a free kick. The free kick is swung in right-footed by Tommy Fraser, Paul Hayes makes a clearance. 9:48 Grant McCann delivers the ball from the free kick left-footed from right wing, save made by Chris Martin. Shot by Paul Hayes from inside the area hits the post. 9:48 Booking The referee books Tommy Fraser for unsporting behaviour. 9:36 Free kick awarded for a foul by Tommy Fraser on Jordan Spence. 8:55 Jonathan Forte takes a shot. Chris Martin gets a block in. 7:02 Foul by Grant McCann on Anthony Griffith, free kick awarded. Free kick taken by Chris Martin. 6:22 Outswinging corner taken left-footed by Kris Taylor from the left by-line to the near post, clearance made by Marcus Williams. 5:57 Gareth Owen fouled by Jordan Spence, the ref awards a free kick. Direct free kick taken by Kris Taylor. 4:30 Grant McCann delivers the ball, Paul Hayes takes a shot. Chris Martin makes a comfortable save. 3:25 Doug Loft takes a shot. Blocked by David Mirfin. 2:47 Grant McCann has a volleyed shot. Save made by Chris Martin. 1:44 The referee blows for offside. Indirect free kick taken by Joe Murphy. 0:45 Free kick awarded for a foul by Paul Hayes on Marc Richards. Lee Collins takes the free kick.